A quick post because it's summer, most of the country is enduring a heat wave, and everyone wants to get the heck out of dodge (myself included!). So let's keep this post short and sweet. Because it's summer, the last thing I want to do in my already warm kitchen is make it warmer. So yay for tarts, pies, and galettes - basically anything that'll warm/cook fast! Pair that with the sweet fruit coming into season right now, and we've got a great match. Let's get baking! In a large bowl, whisk together flour, sugar and salt. In a small bowl using a fork, whisk together cream and egg yolk, set aside. Add the butter to the flour mixture. Using fingers, rub the butter and flour together, breaking and coating the butter pieces until course and grainy. Work quickly to keep butter cold. Mixture will look course and lumpy. Drizzle egg yolk and cream over flour. Continue mixing and squeezing dough with fingers until there is no dry flour left. Dough is ready when it holds its shape when squeezed and is cohesive (some streaks of butter can remain). Add an additional splash of cream if necessary, careful not to overwork dough. Transfer dough to plastic wrap and chill in refrigerator at least an hour, better overnight. Make crème d'amande: in a bowl whisk together flours. In another bowl, beat butter on medium speed until lightened, about one minute. Add sugar and mix until incorporated. Add in egg and mix until no streaks remain. With mixer on low, add in flour and beat until smooth and fully incorporated. Place in small bowl and cover with plastic wrap. Refrigerate until firm, about three hours. Make pâte sucrée (recipe above). Take out crème d'amande and let come to room temperature. Preheat oven to 375 degrees. On a lightly floured surface roll out dough and place into tart shell. Use measuring cup to press dough into edge and use a knife to cut any excess dough to create a neat edge. Freeze for 20 minutes before baking. Partially bake tart: place frozen tart on a baking sheet. Dock bottom of tart with a fork. Cut a piece of parchment paper slightly larger than tart and then crinkle it. Place paper in the tart and fill with pie weights (I use uncooked lentils). 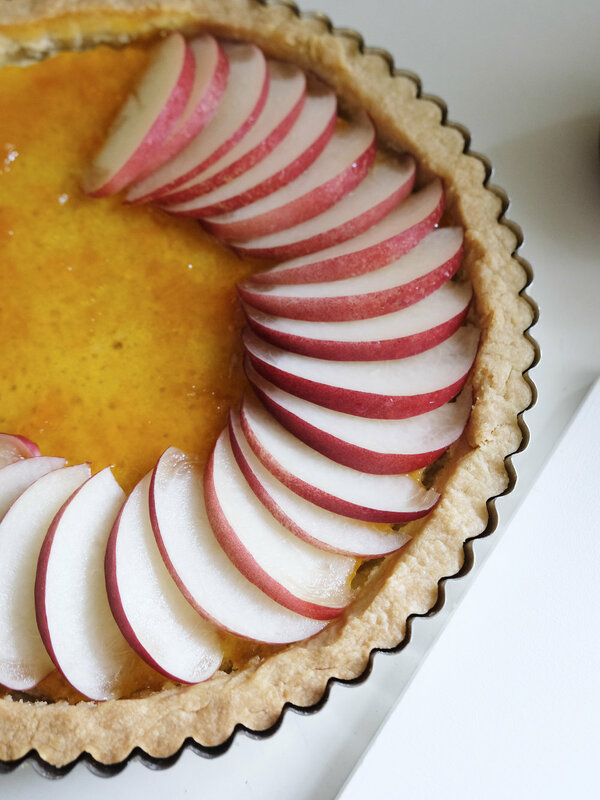 Cut any extra parchment paper so that the top edge of the tart is exposed to the oven. Bake tart for 15-20 minutes until the edges are set and beginning to turn golden brown. Meanwhile, prepare egg wash: in a small bowl with a fork, mix egg yolk with heavy cream. Remove tart from oven and carefully remove parchment and weights. Brush bottom of tart with egg wash and sprinkle with a little bit of sugar. Bake for five more minutes just until egg wash is set. Remove tart from oven and with an offset spatula, carefully spread almond filling. Return to oven until tart shell is golden brown and almond filling is set, about 20 more minutes. Set on wire rack to cool. Spread apricot jam on cooled almond cream. Arrange sliced nectarines in a compact circle. Top with blueberries and lightly dust with confectioners sugar. Serve immediately.